CPAP/BIPAP SUPER HEAVY DUTY 8 - 12 NIGHTS 55AH Battery Power Backup System. WE SPECIALIZE IN BATTERY POWER PACKS FOR Cpaps / BiPaps / VPaps. This is the List of. Cpap Brands and Models that this Battery & Power Cord Bundle will support. NO DREAM STATION AND NO ResMed. Devices, we have other Battery Bundles for these Products. FITS VARIOUS RESPIRONICS, SANDMAN & INTELLIPAP CPAP & BIPAP MACHINES. Compatible with Puritan Bennett GoodKnight 425/425ST BIPAP machines. Compatible with all Sandman Systems including Sandman Auto, Sandman Duo, Sandman Duo ST, Sandman Intro and Sandman Info. Compatible with all IntelliPAP Systems including the IntelliPAP Standard, IntelliPAP Auto, IntelliPAP BiLevel, and the IntelliPAP BiLevel ST. PHILIPS RESPIRONICS: M-SERIES, "50 series" PR SystemOne. Including PR SystemOne 150 REMstar, PR SystemOne 250 REMstar Plus, PR SystemOne 450 REMstar PRO, PR SystemOne 550 REMstar Auto, PR SystemOne 650 BiPAP PRO, PR SystemOne 750 BiPAP Auto. PHILIPS RESPIRONICS "60" SERIES CPAP & BIPAP MACHINES. COMPATIBLE WITH ALL "60" SERIES. SystemOne CPAP & BIPAP MACHINES: including REMstar Plus 260, REMstar Pro 460, REMstar Auto 560, BiPAP Pro 660, BiPAP Auto 760. 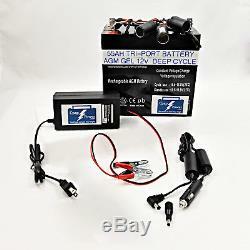 This #5501 Bundle includes the 55AH Battery. OEM Cpap Power Cord that connects Battery to your Cpap (compatible with 90% of Cpap models found in USA) and the S. Battery Charger that is fully computerized and will recharge your battery for repeated use in the years ahead. DETAILS about each of these items can be found later in this description by scrolling down. WE ARE HERE FOR YOU. The reason so many of our customers recommend us to their family and friends is due to the superior level of customer service they received. Even years after the sale. You can reach us for an almost immediate answer. To reach us quickly for personal help with any and all your questions. We Want you to make a fully informed decision, after all, this is your Health we are talking about! Battery & Custom 12V Harness. Battery is fully charged and READY TO USE. Battery has carrying handle, and while it is NOT lightweight, it is completely portable. EASY TO SET UP: -- Just plug it into your CPAP or BIPAP device with the supplied fuse-protected 12V Power Cord that connects to our custom 12V wire harness and IT IS READY TO GO in under 5 minutes! Battery is a HEAVY DUTY 55 AH capacity to supply you with power for most CPAP or BIPAP Devices for up to. 4 to 8 nights of use on a single charge. Varies with pressure settings and use of humidifier or heated hoses. Our Special Harness is wired with Stainless Steel hardware. The ring terminals are soldered to the wires to make a far more dependable electrical connection than merely crimping them. Battery is Maintenance Free, Deep Cycle, Sealed Lead Acid (SLA) and does not require checking fluid level. While heavier that a Lithium Ion battery (which we also sell), these have 3 times the life expectancy (in years of usage) before needing to be replaced. Battery is safe to be used in any position lying on its side or even upside down! You can stash it in your nightstand drawer, ready to use in an emergency. This battery has the latest AGM (Absorbent Glass Mat) technology, making it much safer and more stable and reliable than previous Deep Cycle batteries. This is an improvement over Gel batteries. This battery has a 3 to 5 yr projected lifespan under moderate DAILY usage, and with your occasional usage for power outage backups or camping trips. You can expect it to serve you up to TWICE that long, with proper care. Battery measures: 9 in X 9 in X 5 in and weighs 35 pounds. This is an SUPER HEAVY DUTY unit! TED, STATIC FILTERED, 12 VOLT POWER CORD. These have in-line fuses and static filters. 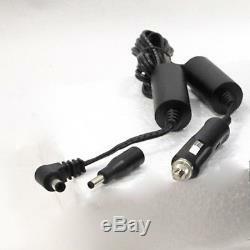 Our power cords are not cheap "after market" knock-offs. WE PROVIDE ONE POWER CORD with your Battery System, (one primary 12VDC power cord and a converter PLUG with a different tip). Between them they fit all the models listed at the beginning of this listing. WILL NOT WORK for DREAM STATION AND NOT FOR RESMED Brand Devices. 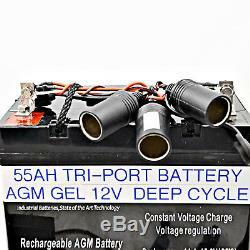 Charging with a different charger, at a rate above 6 Amps/hr, can COOK these AGM GEL batteries they dont dissipate the heat as well as wet cell flooded batteries can. This charger maxes out at 6 Amps/hr. It will never damage your battery. No buttons to push, nothing you need to select. Before it starts the charge cycle, it reads the battery when you attach the clips to the battery terminals. It then knows exactly how much charge to apply and it continues to adjust those levels through multiple stages until it signals you (little green light comes on) to say the battery is fully charged. Takes about 6 to 7 hours to fully charge this 35 AH Battery if is has been discharged to the level that your Cpap shuts down at around 11.3 Volts. 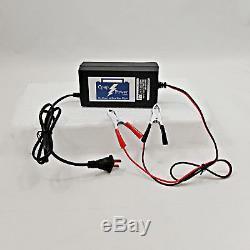 Can be used on ANY 12VDC Lead Acid Battery. Will not Start a vehicle with a dead battery. Only will charge it over time. ALL Our Battery Bundles Are. · SILENT No need to run a noisy generator. · RELIABLE This technology has been around for decades! · SAFE Will not overheat or catch fire. Battery can be used laying flat or even upside down! · SIMPLE & EASY Set up in LESS THAN 5 MINUTES (Like Plug & Play). · MORE CAPACITY Some of our systems will run up to 18 NIGHTS between charges. · PORTABLE -- They all come with carrying handles. Weight is listed in item description above. You can Trust our Quality and our Commitment to Serve You and your needs. BEFORE you consider shopping with us, READ OUR FEEDBACK. See how pleased others have been with our products and service. ALL Our Systems Set Up in LESS THAN 5 MINUTES -- (Plug & Play)! IF YOU DO NOT FIND YOUR MEDICAL DEVICE LISTED HERE. Key Search Words to help cpap users discover this relatively new item on the market, cpap supplies. Breathe, nose, airway, pressure, cord, snore, sleep, bipap, sleep apnea, cpap, bilevel, bipap, vpap, breathe right, cpap battery, alternate power, cpap travel power. The item "CPAP/BIPAP SUPER HEAVY DUTY 8 12 NIGHTS 55AH Battery Power Backup System" is in sale since Sunday, January 11, 2015. This item is in the category "Health & Beauty\Health Care\Sleeping Aids\Other Sleeping Aids". 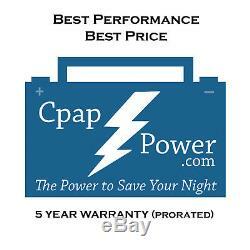 The seller is "cpap-battery-power" and is located in Mukilteo, Washington. This item can be shipped to United States. California Prop 65 Warning: This battery is a sealed, Lead Acid battery which contains Lead Plates and Sulfuric Acid. Leave it sealed and it is safe. Recycle it after YEARS of recharging and peaceful sleep.